On Sunday, April 6, 1997, skaters in San Francisco, Los Angeles, San Diego, New York and Philadelphia joined as one community to make a strong statement against hate and to honor the memory of Shelby Antonio Graham, better known as "Ev'ready". 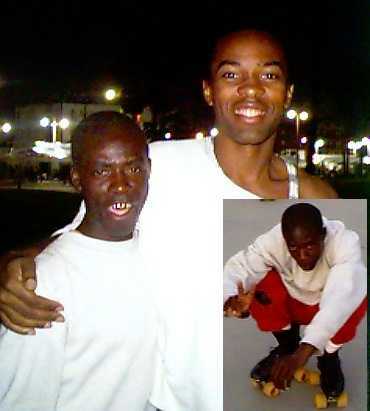 Ev'ready was one of the most popular dance skaters that rolled the Venice Beach area for many years. Millions have watched him on the beach performing to the crowds and welcoming the newcomers as Ev'ready was one of those with a passion for the sport. Ev'ready was found strangled to death on the beach early Saturday morning on March 30, 1997. He was not robbed. He NEVER used drugs or had any enemies. Local skaters who skate Venice Beach with Eveready are convinced that this is a hate crime. This is a situation that we in San Francisco can identify with very easily. Every year members of San Francisco's Skate Patrol and C.O.R.A. (California Outdoor Rollerskating Association) skate from S.F. to L.A. in the Skate Against Violence. This event was created to honor of S. F. Skate Patroller Bruce Marshall, who was gunned down at the Denny's restaurant in Japantown on Nov. 1, 1993. Last year the skate-a-thon was dedicated to the memory of Patrick Hurrican, who was killed as a result of violence that escalated from a bike versus car argument. Ev'Ready was one of the skaters we met and got to know when we skated to Santa Monica last October. We will dedicate the 1997 S.F. to L.A. Skate Against Violence to the memory of Eveready in October.